The Seaga Infinity 5C Combo Vending Machine (INF5C) is the latest invention of Seaga. This vending machine just recently hit the market and is packed with tons of cool features such as the scrolling price display, double pane glass, ADA compliant cabinet design, and dual coils. It is entirely refrigerated and accommodates both snacks and beverages of various sizes. It is easy to operate, program, and maintain. With the sharp looking glass face front, all your product can be seen, so there's no need for additional stickers, labels, or advertising. Bottles and cans of almost any size, as well as pastries, chips, and candy bars, can be easily placed in this machine. This combo vending machine is constructed of heavy duty steel with a powder coat paint finish. It offers 3 removable, adjustable shelves to house the snack and candy selections, and two rows for bottled and canned drinks. The exact configuration can be varied depending on the Buyer's request. Additional features with this combo machine include energy saver settings, LED lighting, a FIFO (first in, first out) product delivery system to help maintain freshness, and a vend detection system. The Infinity contains a dollar bill validator which accepts $1 & $5 bills. The coin unit accepts nickels, dimes and quarters. A credit / debit card reader can also be added for an additional cost, which would provide a cashless vending experience and the possibility of doubling your sales. Another great upgrade is the Smartware software which is a program that can be downloaded to your computer allowing you to set-up all the prices, temperature settings, energy savings options, etc. You can then save these settings to a smart card which plugs into the control board to upload these settings in a matter of seconds. This makes the configuring of the machine on-site very fast and efficient. Troubleshooting can also be accomplished easily using this technology. Both of these two options can be added to your machine purchase for a small addition fee. This combo vending machine will ship directly to you from the manufacturer and will include a full one year warranty on all the parts. A lifetime of technical support and assistance is also available to you as long as you own the machine. Two sets of keys, as well as the owner's manual, will be included with each machine purchase. 1. There is an optional credit card reader which can be added for a small additional fee. The credit card reader will accept all major credit cards and has the potential to greatly boost your sales and bottom line. It will also allow you to log in to your machine remotely from your home or office computer and obtain real-time, detailed sales reports. • Lifetime of Free Technical Support! • 1 year warranty on all our new machines! 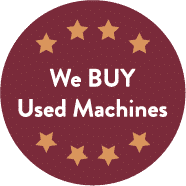 • Buy multiple machines and get a Bulk Rate Discount! • We promise to meet or beat our competitor's prices! Call us for details.